Kat's 9 Lives: Delicious As Usual! 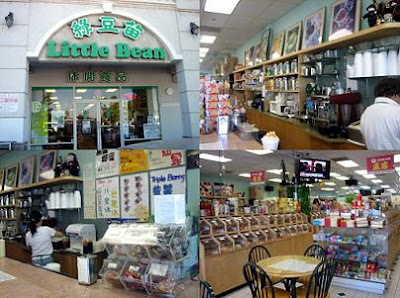 I have been going to Little Bean in Rowland Heights for a long time now. They have never disappointed me and it was great on a hot day. What is up with the weather these days? Are we in a heat wave? BOO! While I was waiting for my hair cut appointment I decided to stop here for my favorite Mango Shaved Ice. It's 10k times BETTER than the one served at Tea Station. After having the bland shaved ice there I needed to come back to this place to remind me how good it can be. As usual the service here is pretty good. They are very friendly and the place has not changed at all. It's part drink, part dessert, and part snacks. There are tables there to dine, games, and TVs. I usually pick up a drink as well. They kind of messed up my order this time but I was okay with it. I wanted Passion Fruit Milk Green Tea, but they just gave it to me without milk. They are usually really nice so I didn't want to say anything and just drank it. Tasted fine. This place is the only place I will consider getting the tapioca pearls. That does say something about their food quality since I abhor most tapioca pearls since they taste like rubber most of the time. The ones here are usually pretty good. Haven't had them in a while, but I believe in them. The boba here is always so good- soft & fresh. I still have to try to mango shaved ice! I always have boba cravings so it's hard for me not to order a boba drink instead. Do you know if the mango shaved ice counts towards the stamp cards still?